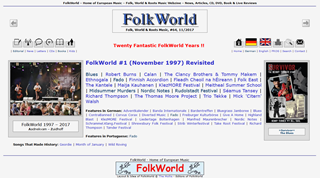 20 years ago, on the 1 November 1997, the very first edition of FolkWorld appeared on the net. That was a time where, certainly in the folk music world, the internet was in its infancy, with very little content being available online, and FolkWorld seemed pretty groundbreaking. 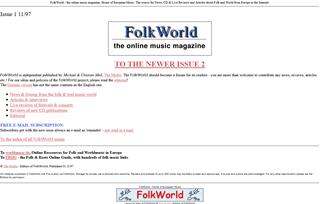 Amazingly, 20 years on, after thousands and thousands of reviews, FolkWorld is still going, and remains popular with folk acts and fans alike. While many have announced the end of CDs already many years ago, the mountains of review CDs that arrive on FolkWorld’s doormat show not only that CDs remain an important medium for folk releases, but also the importance musicians place on independent reviews on the internet. The concept of FolkWorld has hardly changed over the years, and perhaps has not evolved in tune with what has happened on the internet over those two decades, yet I still feel proud of what FolkWorld has achieved - and FolkWorld will still have one of the most comprehensive collections of CD reviews on the internet. FolkWorld has always been a Labour of Love. All contributors work in a voluntary unpaid capacity, doing it just for their love of the music, the desire to promote it, and the joy of discovering new music from reviewing CDs and visiting concerts. However we are, once again, at a point where FolkWorld is struggling to survive. With a number of reviewers having stepped down over recent months, FolkWorld is struggling to keep up with the incoming albums. Maybe you can help? If you enjoy writing, have an ear and hand to describe folk music, and would love to discover new music - maybe you could join our review panel?!? If you are interested, please contact us! Hopefully we will be able to keep going - here’s to the next two decades!